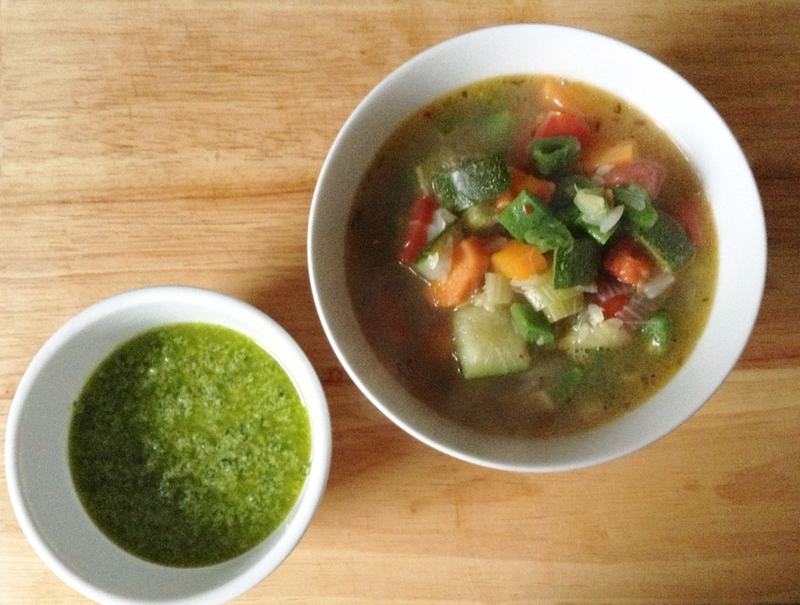 What better to do when you have a surplus of summer veg than make soup au pistou? Freshness is the key here. In fact, there isn’t even any chicken stock in this recipe, just water added to bring out every last drop of the vegetables’ summer essence. I first saw this recipe on either “Raymond Blanc: How To Cook Well” or “Raymond Blanc’s Kitchen Secrets”, I can’t remember which. I have to admit to a certain fondness for the Frenchman who is so passionate, but always approachable. I do feel a bit sorry for Adam, constantly being called on to make coffee, put things in the freezer – once he even got his belly patted to the comment of, ‘Too much beer, eh Adam?’! – but then I remember that he gets to cook with Raymond Blanc and taste most of the stuff he makes for this series – and then I don’t feel so bad any more. Anyway, back to the soup. Basically, it couldn’t be easier so I will tell you the recipe in two sentences. Use whatever vegetables you have and chuck them in a pot with fresh thyme (or Herbes de Provence in an emergency) and water to cover. Boil gently for about 10 minutes until soft and then add fresh tomatoes – every food blogger on earth is soliloquizing about tomatoes right now. I’ll keep my two cents short: I agree with them. The end. 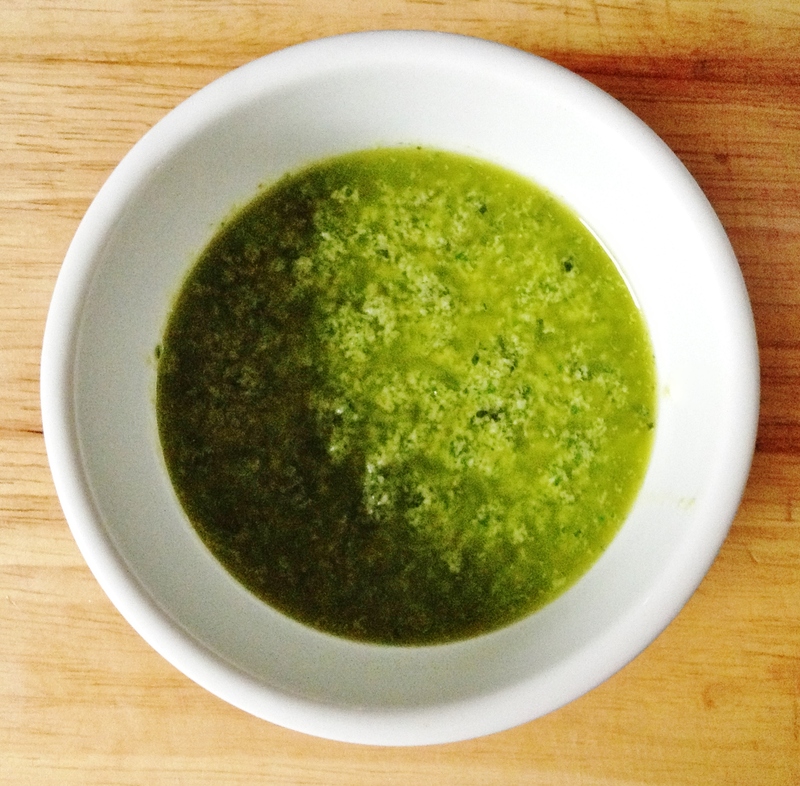 Pesto is pesto. It’s fabulous, we all love it and it peps up everything from chicken to shrimp to vegetables. Basil, pine nuts, Pecorino (because I didn’t have Parmigiano) – if you’re vegan, you can leave out the cheese and just make something akin to basil oil instead – lots of garlic, lemon juice and oil. I didn’t blanch the basil like Raymond advises, but it still stayed bright green and gorgeous. As the summer draws to its inevitable close, hang on to the sunshine by making this soup. Use the remains of your garden’s bounty or the last few zucchini in the green grocer’s bin, before they start getting shipped in from Zimbabwe or somewhere equally far flung. Let your vegetables sing! They are 🙂 but the Italians have always claimed that they came up with it first, and the French argue that they created first. 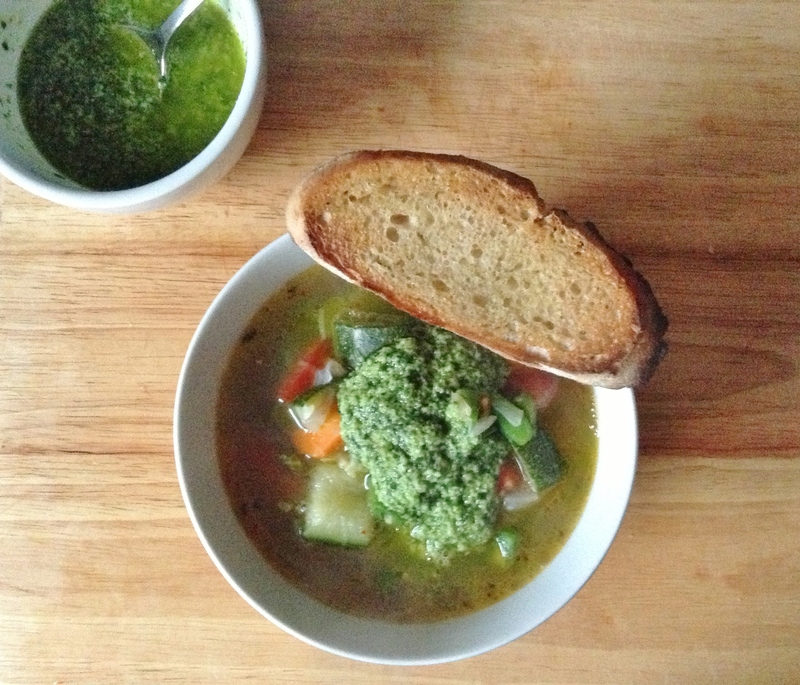 Pesto really can perk up any meal, and it sounds like the perfect accent to a simple, fresh veggie soup like this. I could eat this comforting dish any time, any day! It is that good and that easy.